It softens the blow that Lenny is small and green, with a big, open smile. Oh, and that he’s a puppet. LendingTree hired Jim Henson’s Creature Shop to create the wisecracking character in 2013, and since then Lenny has appeared in a series of TV ads for Lebda’s company. “The idea was that Lenny could be more obnoxious than a real person, and tell people point-blank that they’re idiots not to shop around” says Lebda. LendingTree founder and CEO Doug Lebda with Lenny the spokespuppet at the company's headquarters in Charlotte, NC. Lenny’s message appears to be getting through to consumers, who are flocking to Lebda’s online marketplace for consumer credit. Despite a sluggish U.S. economy and stagnant loan market, LendingTree’s revenue jumped 62% in the first half of 2017 vs. the year before. The company’s revenues from connecting customers with competing mortgage lenders—which accounts for just under half of its business—grew by 28% in the first six months of 2017 despite a 4.2% overall decline in U.S. mortgage originations. And LendingTree’s fees from non-mortgage products—franchises encompassing personal loans, credit cards, and home equity—fared even better, rocketing up 112%. Such explosive growth has propelled LendingTree’s stock into the stratosphere. As of late August, its shares had soared 120% this year, to $223. Since going public in 2008, LendingTree (tree) has multiplied shareholders’ money 30 times, delivering annual returns of 47%. 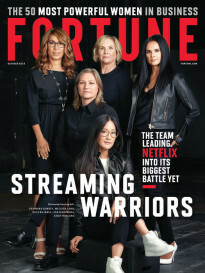 Its nine-year record ranks third among all companies with market caps that now exceed $2 billion, trailing most notably the 50.1% annual gains at Netflix. Thanks to this potent combination of business expansion and investment returns, LendingTree ranks No. 3 this year on Fortune’s 100 Fastest-Growing Companies list. But if you ask the CEO, there is plenty more growth to come for his two-decade-old company. Lebda, who has personally made $500 million on LendingTree in stock and options, justifiably claims that his brainchild is helping to lead a revolution in the way consumers buy financial services. 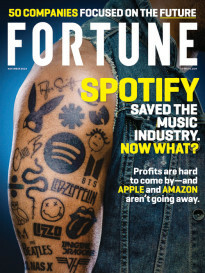 “Lending is way behind every other industry in entering the Digital Age,” he tells Fortune. LendingTree offers consumers the same kind of platform for evaluating loans that, say, Expedia (expe) provides for hotels and eBay (ebay) proffers for sundry products. Though money is the largest and purest of commodities, where choices should logically be based almost entirely on price, borrowers do far less comparison shopping online for loans than they do for pretty much any other type of product—even though the biggest purchase of most families’ lifetime is a mortgage-funded home. A recent study by the Consumer Financial Protection Bureau found that 47% of all homebuyers don’t compare mortgage offers before choosing a lender. Yet the potential savings are gigantic, because the offers vary so widely in interest rates and points. A LendingTree survey found that customers who received five quotes on its platform for a typical 30-year home loan of $223,000 witnessed a difference of 52 basis points from the highest to the lowest quotes. Taking a 4.0% vs. a 4.52% rate would save the borrower $24,000 over 30 years. The more consumers become aware of that math, the bigger LendingTree’s future growth could be. T0 Lebda, the looming digital disruption in financial services is as much cultural as financial. Today, getting a mortgage is the least web-enhanced of any big purchase. In the new era of tight credit, folks are extremely unsure of winning approval for a home loan. Hence, consumers still rely heavily on lending officers recommended by their realtors or financial advisers to steer them through the labyrinthine process. Choosing someone whom their realtor swears by trumps shopping for a lower rate. And when borrowers succeed in securing a home loan after four months of shuffling reams of paperwork, their overwhelming reaction is frequently gratitude to the lender for providing the funds to close. The whole “relationship” system discourages customers from shopping for the best prices. To grasp LendingTree’s potential, it’s essential to understand its mechanics. LendingTree does not make loans. It’s a search engine that matches customers with lenders via its online marketplaces for a wide array of loans. For example, people seeking mortgages visit LendingTree.com, where they’re guided through a series of around 20 prompts calling for such information as credit scores, the loan amount requested, and the proposed percentage down payment. Within moments of hitting the submit button, two pages of quotes pop up from a minimum of four, and maximum of five, lenders. This writer invented a profile using a better-than-average credit score of 700 and received 11 quotes from four lenders on a mythic $300,000 mortgage—five on a 30-year fixed loan, four on a 15-year, and two on a five-year adjustable-rate mortgage, or ARM. See the full 100 Fastest-Growing Companies 2017 list. The spread in pricing boldly illustrates the importance of bargain hunting. The best deal was 4.362% on the 30-year with an upfront fee (defined as “points”) of $3,430. A rival was offering 4.689%, or 33 basis points more, with a higher fee. The differences were similar for the no-fee loans, competing quotes ranging from 4.625% to 4.375%. Choosing the lower number on the no-fee loan would save a borrower almost $4,000 over the first five years. LendingTree generates revenue by selling leads. Every time one of its 400 lenders provides a quote for a customer seeking a mortgage, that lender pays LendingTree a fixed fee, whether it eventually writes that borrower a mortgage or not. The fee is determined in an auction similar to Google’s system for selling clicks. The lenders bid for a place among the four or five slots depending on which types of customers, and how many, they seek to reach. For purchase loans, the fees range from $3 to $35 per quote, or “match.” “If a lender wants very large volumes, say they want to be guaranteed 2,000 matches a month, they would pay higher fees,” says Neil Salvage, LendingTree’s president. If a small lender seeks customers in targeted areas, such as four zip codes in North Carolina, they’ll also pay higher fees. Getting referrals on the most creditworthy borrowers, those with high incomes and 800 credit scores, and the most likely candidates to qualify for the mortgage, also commands a premium. Though it’s a growth machine, LendingTree is far from a digital giant. It forecasts revenues for 2017 of just under $600 million, a figure too low to secure a place in the Fortune 1000. What excites shareholders, it seems, is how rapidly it’s gaining traction, and its role in transforming the way Americans shop for money. Since 2013, loans generated from LendingTree leads have soared from 0.5% of the total U.S. mortgage market to an estimated 1.4% in 2017. So although the total mortgage market has shrunk from $1.9 trillion in 2013 to a projected $1.7 trillion this year, LendingTree’s dollar volumes have more than doubled, from $9.6 billion to a yearly pace of $22.5 billion. Those numbers make LendingTree by far the industry’s dominant player. Lenders now originate 4% of their mortgages from online comparison-shopping platforms, and the figure is growing fast. LendingTree’s portion, meanwhile, accounts for over one-third of the sector. The remaining two-thirds is divided among a number of rivals, including Bankrate, QuinStreet, and Zillow. LendingTree is also the leader in home equity, a separate category of home loans, where its market share has multiplied 19 times, to 1.9% since 2013. What gives LendingTree its edge? Its scale is a big advantage. As the industry’s pioneer, LendingTree’s been building a powerful brand for two decades, far longer than its current rivals. It cycles two-thirds of its revenues into advertising, with big chunks going to TV spots and securing top placement on Google (googl). “The heavy ad spending gives us a ‘flywheel’ effect,” says Lebda, using an analogy from business strategist Jim Collins. “The more we advertise, the more leads we can generate for lenders. And the more leads we generate, the more lenders join our network. That adds more revenues, which generates more advertising. The flywheel keeps spinning faster.” LendingTree also attracts customers by ranking lenders based on reviews from its multitudes of borrowers: For example, its biggest lender, Quicken, gets 4.0 out of 5 stars. Though lenders don’t like getting publicly bashed by customers—a major reason that some of its rivals don’t provide ratings—they tolerate LendingTree’s ratings because they need its leads. In the past couple of years, Lebda has aggressively diversified into underserved, high-growth areas such as credit cards and personal loans. Non-mortgage products, in fact, now account for 53% of LendingTree’s revenues. The company has been especially successful with personal loans. It’s a rare lending category that’s growing fast, and banks struggle to make money in personal loans, leaving the field wide open to digital newcomers. Lendingtree’s two-decade history is a primer in the art of survival. In 1994, Lebda was seeking a loan to purchase a condo in Pittsburgh. “I looked up the rates in the newspaper,” he recounts, “but the banks didn’t offer the rates as advertised.” So Lebda invented a platform where lenders would present real, actionable quotes online instead of the typical teaser rates that he’d encountered. Two years later as a 26-year-old MBA student at the University of Virginia’s Darden School, he launched the precursor to LendingTree. Lebda’s startup initially prospered as the first company ever to provide online comparison shopping for financial services. But the dotcom bust hammered lending, and in 2003, Lebda sold LendingTree to Barry Diller’s IAC for a handsome $734 million. (“That’s probably a lot more than it was worth,” Lebda remarks.) He rose to become president of IAC in 2006, overseeing the growth of such brands as Ticketmaster and Home Shopping Network. But in 2008, LendingTree was reeling once again, this time from the financial crisis, and IAC planned to spin it off. Lebda’s mentor at the company was GE (ge) legend Jack Welch, who served as a consultant for IAC. “Jack walked into my office and said, ‘You’re crazy if you don’t take your creation back when they sell it,’ ” Lebda recalls. He took the advice. And in a reversal of fortune, the financial crisis caused a big shift in the mortgage market, hugely benefiting LendingTree. Banks retreated on home loans, issuing few purchase mortgages, and relying on the booming refi market for fresh business as rates plummeted. Refis are a lot more automated, more web-friendly, and easier to close than mortgages for purchase. So aggressive newcomers like Quicken and LoanDepot captured big shares of the refi market from the major banks. Unlike the banks, Quicken and LoanDepot relied on comparison-shopping sites for their leads. “It was the refi boom that lifted the nonbank correspondent lenders that got many of their customers from LendingTree,” says Jeff Douglas, founder and CEO of Wyndham Capital in Charlotte, one of the new wave of lenders. Wyndham gets more than half its customers for its $1.8 billion in annual originations via referrals from LendingTree. To drive growth now, LendingTree is aiming to attract far more business both from the online lenders that have fueled its recent expansion and the traditional holdouts—big banks such as J.P. Morgan Chase (jpm), Bank of America (bac), Wells Fargo (wfc), and Capital One. And the change in the mortgage mix is luring the latecomers. “The banks aren’t generating sufficient organic volume in their branches now,” says Lebda. “It’s like a Marriott or Hilton when demand is low, they go to Expedia for the extra customers.” Now most of the major banks are paying fees to obtain matches from LendingTree. Lebda predicts that the more the banks automate their clunky lending process, the more business will flow to the comparison-shopping sites, and especially LendingTree. The easier the process becomes, the less power the branches, real estate brokers, and relationships will exert. “The banks are saying, ‘People are going to the Internet. We need to catch this wave,’ ” he says. The banks, he reckons, are likely to gravitate to LendingTree because it can generate the highly targeted customers they need far more cheaply than serving them through branches and running their own ads on Google. Still, Lebda isn’t necessarily counting on a boom in fees from the big banks to lift LendingTree. He plans to grow either way. In his view, the old relationship model will fade as customers move to comparison shopping on the web, as they have in everything from hotels to airlines to books. If branch-heavy lenders don’t move rapidly onto the digital market-places, he says, his big customers, the Quickens and LoanDepots, will simply keep poaching their traditional customers. And the banks can’t say they weren’t warned. Lenny told them all along.